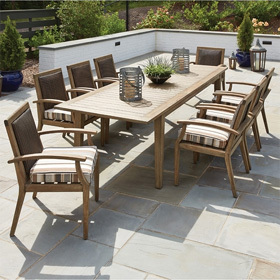 Popular patio furniture manufacturers Woodard and OW Lee now offer outdoor bar table bases that coordinate with their bar table tops. These pieces allow for further customization and are great for homeowners seeking to create unique centerpieces for their bar-height outdoor arrangements. Material options include aluminum and wrought iron, while sizes include small and medium. Bar table bases are offered in circle and square shape designs.